CoreVR is easy to share! With the VR button on 3D Showcase, your viewers can launch and explore your Spaces in VR without any additional work. Matterport VR Spaces can be shared by sending a URL or QR Code, or turning the link into a button on your website. 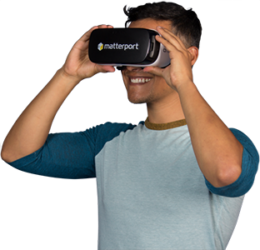 Matterport VR returns your user to your native mobile site, so you can leverage VR without losing viewers. Virtual reality is poised to be the next big tech adoption. Don’t miss your opportunity to be on the cutting edge. High adoption rates and active users provide a built-in user base for your spaces.